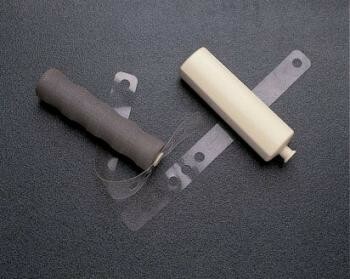 These are versions of the Standard Built-Up and Lightweight Foam Handles with utensil apertures in both ends. Kings Double Ended Handles with Strap...These are versions of the Standard Built-Up and Lightweight Foam Handles with utensil apertures in both ends. They are supplied with a transparent adjustable strap and a fixing spigot that fits in the second hole. A second utensil can be used e.g. the Rocker Knife or Angled Knife with or without the strap, to create versatile one handed cutlery.Spare straps are also available in packs of 10. Strap 210 x 20mm (8 x 4/5").